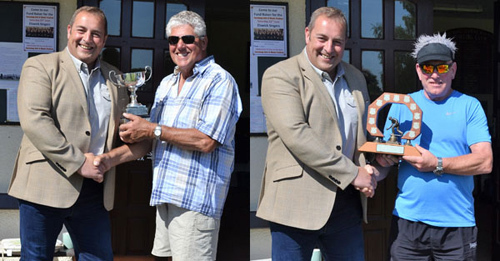 The Garstang Subscription Bowling Club was again the venue for the Lancaster and District Group round of the 2018 Provincial Bowling Tournament and just like last year, the weather was glorious, with temperatures reaching 25oC. Pictured left: Scott Devine (left) presents the winner’s trophy to Dennis Eccles. Pictured right: Scott Devine (left) presents the runner-up trophy to Harry Robinson. Not only were the competitors feeling the heat, but friends and family had also turned out to enjoy a warm and pleasant summer afternoon, as well as to offer their support of course. While the number of participants taking part was small, competition for a place at the West Lancashire Masonic Charity Bowling Tournament was intense, although it has to be said the rivalry was very good natured, with plenty of banter amongst the competitors. The group round winner was Dennis Eccles of Greta Eccleston Lodge No 8895, who held his nerve in a keenly fought final against Harry Robinson from Pilling Lodge No 7879. The competition for the ’11 up plate’, was played out between David Sawyer of Great Eccleston Lodge and David Christopherson of St Michaels on Wyre Lodge No 8348, with the eventual winner being David Sawyer. Presenting the trophies was the Lancaster and District Group Vice Chairman Scott Devine, who had watched the games with keen interest. Scott enthusiastically thanked all the participants for their attendance and support of the event, but particularly thanked David Christopherson, the group bowling representative, for his work in organising the event. Bowling is fun – official.